If you want to migrate your dictionary to a new machine, or you have mistakenly added a word to the dictionary and need to delete that word, then you need to locate and edit the private dictionary. 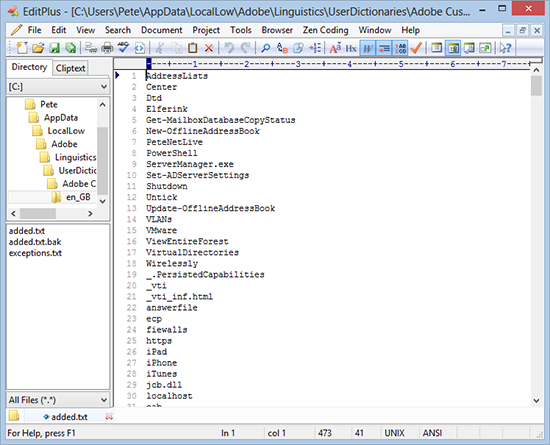 With older versions of Dreamweaver the private/personal dictionary was a file with a .tlx extension, and it was in a completely different location! I spent a LONG TIME searching the net for the correct location for CS6. In the end I had to add a nonsense word into the “Add to Personal” dictionary, then use Agent Ransack to search the entire drive for the file that contained that word! 1. First fire up Dreamweaver and see what language you have the dictionary set to (this will matter in a minute). 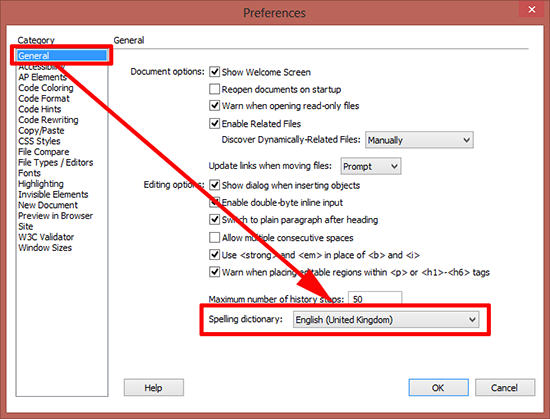 Edit > Preferences > General > Spelling Dictionary > Take note of what it is set to. Note: You will notice the language of the parent dictionary dictates the path to the custom dictionary. 3. You can now open the file with your favourite text editor and remove any incorrect entries, or migrate it to a new machine.